Lillet is a classic – and perhaps the quintessential – French aperitif, blending Bordeaux wines with macerated fruit liqueurs. It is an elegant drink traditionally served over ice with an orange twist. Lillet is made from some of the finest ingredients around the world, including the beautiful wines of Bordeaux, and the best citrus fruits, peels and spices. These ingredients are carefully married together until perfectly blended and left to age in oak vats to allow the aromas to mellow. The finished product is subtle yet rich, fruity, and has a characteristic elegance. 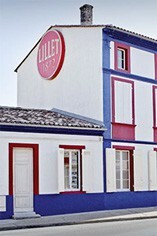 The Lillet brand of fortified wine was founded in 1872 in the small town of Pedensac, near Sauternes in the Graves sub-region of Bordeaux. By the early 20th century Lillet was already very famous within France as a drink served at very special occasions and official receptions, but it was once Lillet was advertised overseas that it became the in vogue aperitif in bars around the world. It also became particularly popular as an ingredient for cocktails – something that was immortalised by Ian Fleming in his 1953 novel Casino Royale when secret agent James Bond invented a Lillet Martini and named it the “Vesper”, after his love interest in the story. And Lillet's reputation as a beverage of distinction and elegance is still running strong today.